Last week saw the conclusion of the Civil Service Live road shows across the country where DVLA Business Services exhibited at 2 events. Civil Service Live brings together civil servants from across government departments and agencies, as well as private sector organisations, to share ideas and best practice. Our objective was to raise awareness of DVLA as a service provider and demonstrate the potential of us offering services to them instead of having to procure from the commercial marketplace. 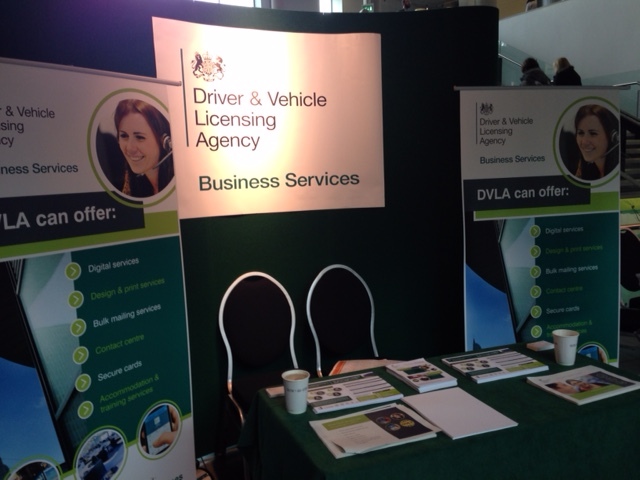 Representing DVLA at an open event always makes you aware that you may have to answer questions such as, “‘Can I drive on my Tanzanian driving licence in the UK?” or “How do I get a replacement registration certificate?” but we were prepared. We promoted our print & mail opportunities, telephony platforms and digital services. We were delighted by the response from attendees, sharing with us that they thought this was a great idea to save money across the Civil Service. Armed with our promotional leaflets we told them to go back to their commercial directors and procurement managers with the message that DVLA is a service provider which is “in government for government”. In London’s Queen Elizabeth Conference Centre we targeted many more Civil Servants. We met colleagues from big departments such as the Ministry Of Defence, HM Revenue & Customs, Department for Work & Pensions, and smaller departments such as the Valuation Office, Privy Council and department of Science and Technology Group. Given our aim of spreading the word about DVLA’s services across government, this proved an extremely productive few days. Civil Service Live is an ideal platform to engage with other Civil Servants. Hopefully these conversations and exchanges of contact details will result in DVLA providing services to other parts of government in the near future. Ever wondered how DVLA buys or delivers its IT?